Savvy Spending: Cici's Pizza: Free Adult Buffet or Pizza to Go when you download the App! Cici's Pizza: Free Adult Buffet or Pizza to Go when you download the App! 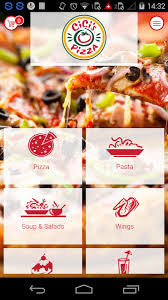 You can get a FREE Adult Buffet OR 1-Topping Pizza To Go by downloading the CiCi’s app via iPhone or Android Devices. Once you download the app, register for a new account and you’ll see the offer in the ‘News and Offers’ section of the app (no purchase required to receive this offer).